You do not need to be an expert to be able to export GroupWise mailboxes to Exchange mailboxes, neither do you need to burn a hole in your pocket for the same. 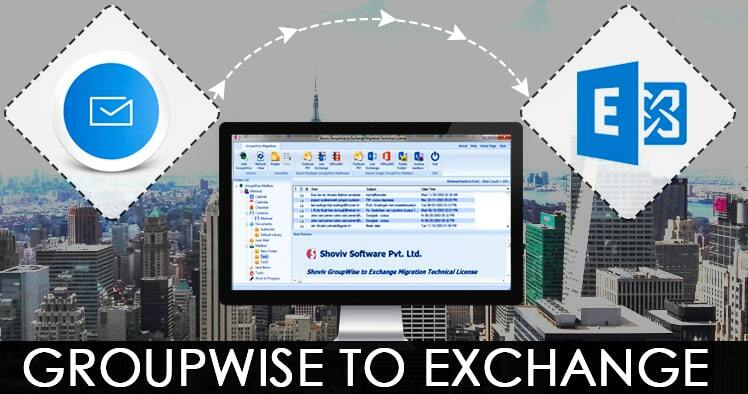 Buying the GroupWise to Exchange migration tool by Shoviv Software is the best decision you will make with regards to the task to export GroupWise mailboxes to Exchange mailboxes. This tool is capable of exporting GroupWise mailboxes not only to Exchange but also to Office 365 with the same efficiency. It comes with money-back guarantee, and you get to try the tool out with a free trial version. It would be delivered instantly to you and you can export GroupWise to Exchange with the following features. This tool comes with a Graphic User Interface which lets you export GroupWise to Exchange irrespective of your technical knowledge in the area. So even beginners can get expert-quality results whenever they use this tool. With the user-friendly Graphic User Interface of this tool you can export GroupWise to Exchange easily. The algorithm of this tool lets users of every kind perform the export task easily, providing a simple environment to execute fast migration. The overall process is quite easy on all kinds of users. In the process to export GroupWise mailboxes to Exchange, you can establish connectivity with GroupWise using various options. One can connect using these options- 1. Default, 2. Include proxy, 3. Remote Mailbox path, 4.Online, 5.Cache mailbox path. The user can choose from among these according to their need. This tool is useful not only to export GroupWise mailboxes to Exchange mailboxes but for Office 365 also. The GroupWise data files may be migrated into Office 365 mailboxes, all one needs is to use the Office 365 user credentials. Full access rights to selected Admin user is required to perform the task. To migrate the files easily, the user is at liberty to use the mapping facility. Using the mapping facility you can move files from the source mailbox to the target mailbox. This is the best ever tool to export GroupWise to Exchange Migration you will ever find. It converts GroupWise files into Live Exchange server mailboxes. As in the case of migration of GroupWise to Office 365, the mapping option can be used in this case too. Just use that option and you would be able to move whichever files you want from the source folders to the target mailboxes. Using this tool to export GroupWise mailboxes to Exchange mailboxes would let you export single as well as multiple files at once. In case you want to move large GroupWise mailboxes to the PST format, you can utilize the PST file split option. So while the export of GroupWise files to the PST format you can simply split the PST files into smaller files. The number of PST files would be decided by the client himself. With this tool, the user is free to migrate GroupWise files by bunch or individually if they an Outlook profile or Live Exchange server, Office 365 or any other IMAP/POP account. The user can migrate selected files to Archive mailbox as well as Public folder. With this tool, you can decide the final format of your migrated files. So once you are done exporting GroupWise to Exchange, you can choose from among the options. You can save the files to EML as well as MSG, whichever suits your needs. The mapping facility of this tool lets you map your GroupWise mailboxes to the format of your choice. Thus using this facility you can map source folders to the destination folder- PST/ Live Exchange server/ Office 365, whichever your choice. This facility is helpful in changing the name and location of the source and target folder. With this feature of the tool, you can screen the contents of the files you are migrating. Experts always advise exporting GroupWise files to Exchange only after screening the data to ensure accuracy. Keeping that in mind the screening facility has been added to make sure the user remains reassured regarding the safety of the process. Filtering files has been made easier by this tool for its user. In the middle of the migration process, you can use the filter option to filter items on the basis of date range or item types. You will never regret buying this tool since we provide a free trial version with all the facilities of the full version. You can check out the features, use it to export GroupWise mailboxes to Exchange mailboxes, then decide whether you want to buy it. Both the full version and trial version are available in the link below. To test the free demo of the tool, click here.